Spanish which is also popular for its other name Castilian refers to a Roman language and the native language of the huge part of the inhabitants of Spain. The largest number of speakers of the Spanish language is in Mexico. Presently, Spanish has become part of the official languages used in the United Nations. It is also known as the Mercusor and the European Union’s official language. Spanish is also among the group of Ibero-Romance which developed from multiple spoken Latin dialects in Iberia and spread gradually after the Castile Kingdom in Spain expanded into Southern and Central Iberia. The enrichment and development of the Spanish vocabulary can be attributed to the contact with Arabic and Basque. Over time, it started to adopt and develop new and foreign words. The popularity of the language allows it to reach the different states of America, Asia-Pacific and Africa. At present, the Spanish language ranks third on the most universally used language online next to Mandarin and English. The Spanish language also ranks third in the languages used for international communication next to French and English and third on the list of the most studied languages worldwide. If you want to learn Spanish, then you have to make sure that you spend time fully understanding all the major components of the language including correct Spanish pronunciation such as its vowels, easy and difficult consonants and accent marks, Spanish grammar which includes its articles, nouns, pronouns, prepositions and verbs and the Spanish vocabulary. 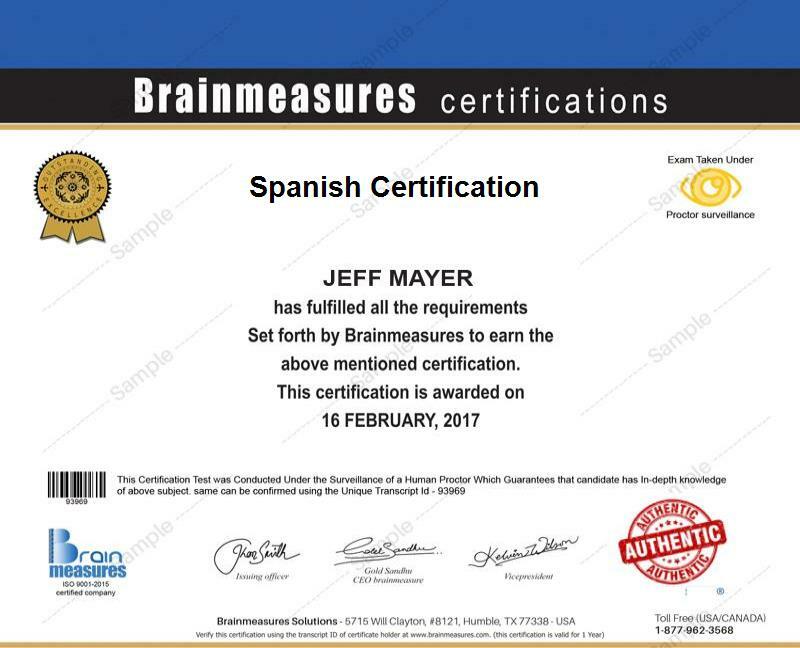 If you want to improve your skills in speaking and writing the Spanish language, then it is highly recommended for you to take up the Spanish certification course which is now accessible at Brainmeasures. The Spanish course offered by Brainmeasures is guaranteed to help you obtain a clearer background about the language, improve your ability to write and speak Spanish words and enhance your vocabulary. The highly comprehensive Spanish training which you can expect to get from the online certification course works in allowing you to fluently, coherently and impressively speak Spanish even if you are a non-native. The Spanish language certification course from Brainmeasures is a major help in your attempt to become more comfortable and conversational when dealing with situations that require you to speak the language. With the online Spanish course offered by Brainmeasures, learning Spanish will no longer become impossible. You will definitely find the task of completing the whole course and receiving your certificate rewarding because you will notice a significant improvement on the way you speak, pronounce words, write and construct sentences both written and oral using the Spanish language. Anyone who wishes to learn how to speak and write using the Spanish language fluently and coherently can greatly benefit from the Spanish certification course offered by Brainmeasures. It is the most ideal certification course for you if you are one of those who plan on working abroad, understand the Spanish literature either for personal or professional reasons or move in a country or region where the majority of its residents speak in Spanish. Different positions with a more stable pay will become available for you as soon as you complete a Spanish certification course. If you hold executive positions that require Spanish language experts, then you can expect your earnings to range from $40,000 to $79,000. If you use your Spanish certification to work as a Spanish translator, then you can expect this to be a huge help in earning around $12 to $23 per hour with overtime pay of around $17 to $33 per hour. Note that there are a lot of industries that require your services and you can expect to earn even higher if you work not only by offering translation services but also by working in law firms, hospitals and other health and medical centers and institutions.